YACoin has started as a CPU mining coin, but now as with many other cryptos there is no point in mining it with anything less than a GPU. 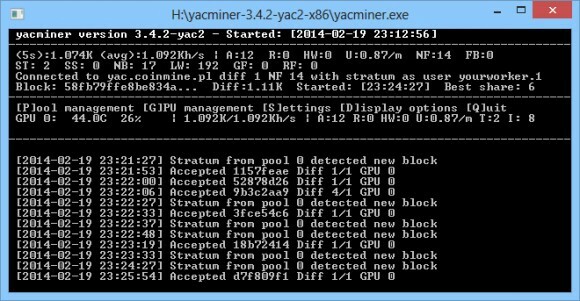 YACoin requires special miner software for OpenCL mining and it is called yacminer, a miner based around cgminer and designed for mining specifically YACoin with its Scrypt-jane algorithm. This miner software is intended for use on AMD GPU mining systems, for Nvidia GPU mining you better go for CUDAminer. As you can see from the screenshot above currently the hashrate you can get from a Radeon R9 280X GPU mining YACoin is not that high compared to some other cryptos, but that is due to the specifics of the algorithm being used here. Also note that the Intensity value is low, you need to keep it lower than you normally would mining other cryptos as higher value may start giving you HW errors. Below you can find the download link for the latest version of yacminer 3.4.2-yac2 for Windows. YACoin is robust, secure and reliable open source software that is run by a community of volunteers. Anyone is welcome to add to YACoin, whether by contributing code, or if that’s not your thing, translations, how-to’s or anything else you can think of to benefit YAC. YACoin was created in May of 2013 and was the first to introduce the N parameter of Scrypt.